Monthly Gentle contact lenses are made with the best quality silicone hidrogel. They have high water content that provide comfort. 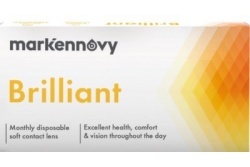 These contact lenses admit a great variety in radius and diameters. They are perfect for high parameters and special measurements. Gentle contact lenses admit high sphere and cylinder values. These contacts are made with biocompatible silicone hydrogel, adding hydration to the eye extending its use. You can find them in spheric, toric and multifocal contact lenses. They are made with high quality silicone hydrogel, allowing its use for many hours. They are the most comfortable from this range. You can find them in spheric, toric and multifocal.